At Rest: Boulogne Eastern Cemetery, Pas De Calais, France. Grave ref. III. A. 28. 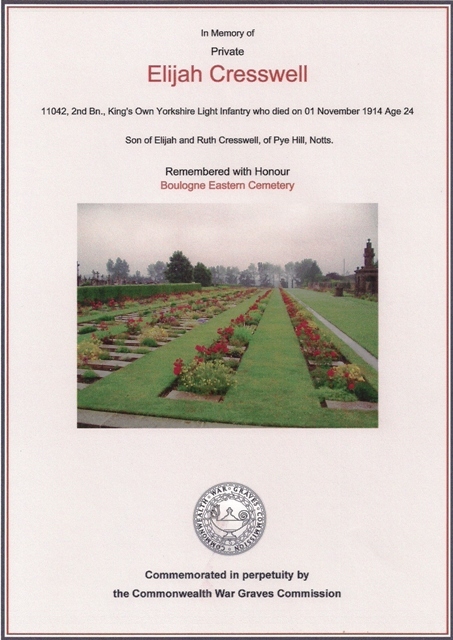 Elijah Cresswell was born in 1890, the son of Elijah Cresswell, Undermanager of James Oakes & Co’s Pye Hill Colliery and his wife Ruth (nee Street). The family lived at Fanfields, Pye Hill Villas where there were four tied cottages, one of which was provided for the Undermanager. 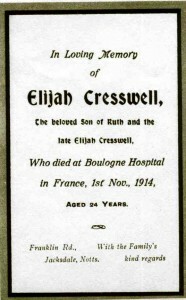 Elijah and Ruth Cresswell had fourteen children in all: Sarah Ann b. 1880, Ada b. 1881, Abner b. 1883, Charlotte b. 1885, Bertha b. 1886, Elizabeth b, 1889, Elijah b. 1890, Ruth b. 1893, Edith Hannah b. 1895, Francis Cyril (Frank) b. 1897, Kate Annie b. 1899, Arthur William b. 1900, Leslie and George b. 1901 (twins). Sadly one of the twins, Leslie, did not survive the birth. Prior to joining up Elijah was employed as a coal miner loader. 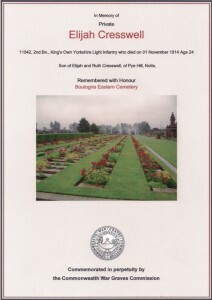 Before war started, he volunteered at Doncaster for regular service and was to become a very early casualty of the war, dying of his wounds on Sunday 1st November 1914, aged 24 years. A relative has been able to tell us …. “It was said that he was sent into battle with ammunition that would last no longer than five minutes. He hurriedly wrote a letter to his mother after he had been shot and handed this to a friend who lived to deliver the letter”. Elijah was taken to the base port of Boulogne, one of the chief hospital areas used by the British Army on the Western Front where he died of his wounds. A Free Press newspaper article, entitled “Selston Roll of Honour” written in late 1916, quite some time after his death, under the sub-heading “Jacksdale Ward” mentions “Pte. 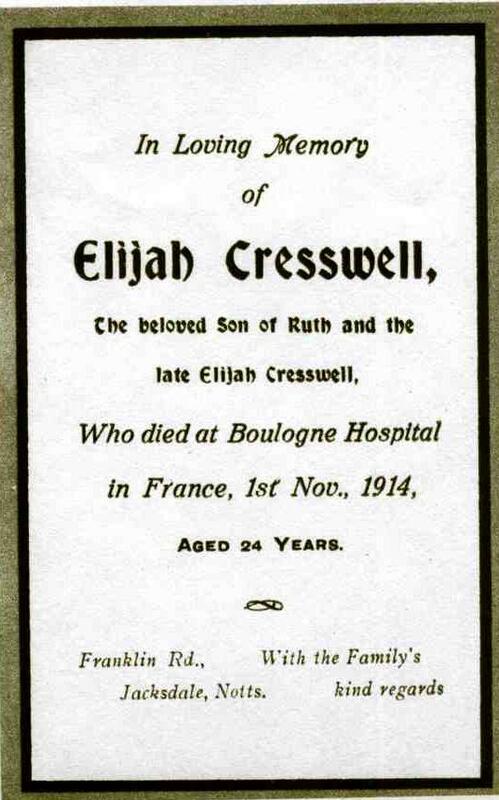 Elijah Cresswell in regular army before the war, sent abroad Sept 1914, killed same month”. In March 1915 his personal effects of £3 7s 3d were sent to his mother and later, in June 1920, a £5 war gratuity was sent to his eldest brother Abner as, by that time, both of Elijah’s parents had died. Elijah was a recipient of the 1914 Star (& Clasp) as well as the British War and Victory Medals. In 1903 Elijah’s sister Ada had married into the Wilmott family and was therefore related to both George and Wilfred Wilmott, two other casualties of World War One. 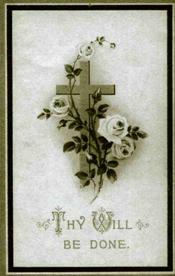 Sister Charlotte was to marry Fred Daley who also served. Edith Hannah married into the Grundy family. 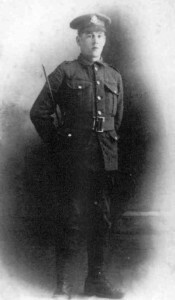 His brother Francis ‘Frank’ Cyril Cresswell served with the Machine Gun Corps, surviving the war and achieving the rank of Corporal.